The film charms and inspires thanks to Knightley’s on-screen energy and charisma. As she often does, Knightley the performer disappears into the role, thus delivering a compelling take on the fascinating life story of a literary icon. 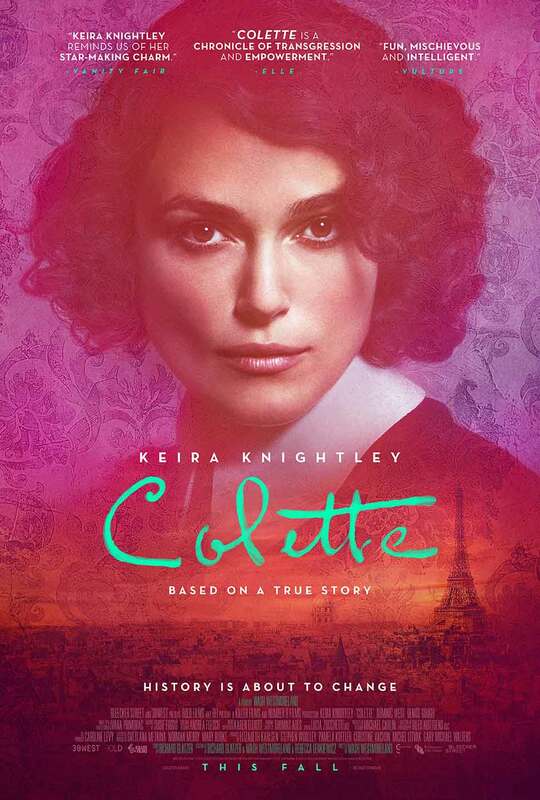 Directed by Wash Westmoreland (“Still Alice“), “Colette” dramatizes pivotal moments in the early life of Sidonie-Gabrielle Colette (Knightley). One of France’s most important literary voices of the 20th Century, Gabrielle was at first just a country girl enamored of a famous Parisian man of letters, Henri Gauthier-Villars, known by his pen name, “Willy” (Dominic West). Willy fulfills Gabrielle’s dream of marrying her, but their subsequent life in Paris is not what she imagined it would be. As if the pretentiousness of Paris’s elite weren’t enough, she learns in short order that Willy is quite the libertine, almost incapable of marital fidelity. This discovery, however, starts a new chapter for the couple. The two resolve to move forward with honesty, and Gabrielle becomes a trusted partner as much as a wife. That partnership soon extends to writing. Enamored of Gabrielle’s wit and stories from her school days, Willy entreats her to pen a novel. The resulting work, “Claudine at School”, published under Willy’s name, becomes a sensation. The couple soon are the toast of Paris. Drunk on the adulation of the city’s artistic avant-garde, Willy insists Gabrielle keep writing “Claudine” stories, even against her wishes. But write them she does, and as their fame grows, so does Gabrielle’s confidence. She begins to go by the name “Colette” and with Willy’s blessing starts exploring her growing attraction to women. As she comes into her own, she at last asks Willy to pen her future works under her own name. Predictably, he balks. The battle that results between the two would go on to define both their legacies. The real-life Colette went on to influence French letters and culture until her death in 1953. Westmoreland keeps the narrative lens of “Colette” focused on her years with Willy, to the film’s benefit. Arguably, it’s this chapter in the author’s life that shows she was truly a woman ahead of her time. The film’s script, by Westmoreland, Rebecca Lenkiewicz, and the late Richard Glatzer, presents that chapter as a series of intimate episodes unfolding in front of the unmistakable splendor of turn-of-the-20th-Century Paris. This is the Paris of the belle epoque, the “Beautiful Age,” full of its scandals, its personalities, and its artistic spirit. The film takes a methodical approach to how Colette as a personality comes to flourish in that place. That patient approach yields a rewarding entertainment experience, full of wit, charm, and verve. At the center of that experience is, of course, Knightley. “Colette” requires Knightley to credibly convey the title character’s evolution as a person over roughly a decade. Her transformation from naive country girl to pioneering literary artist is remarkable to behold. Time and circumstance all whittle away at Knightley’s Colette, like a sculptor trimming away excess to reveal truth. But through it all Knightley projects fierce intelligence and resolve, in her eyes and in her expressions. The film provides its star with wonderful foils and sparring partners to aid her efforts. Dominic West’s complex take on Willy is another of the film’s strengths, compelling on its own and for what it draws out in Knightley. Meanwhile, other women in Colette’s orbit in those years are brought to life memorably, as well. Watch for stellar work from Tony-nominated actress Denise Gough as norm-defying aristocrat Mathilde “Missy” de Morny and Eleanor Tomlinson as Louisiana-born bourgeois heiress Georgie Raoul-Duval. For those handicapping next year’s awards shows, “Colette” is a must-see. Knightley’s performance here should join the shortlist of “Best Actress” front-runners, and nods for Best Original Screenplay and Costume Design would not be surprising. However, “Colette” isn’t just for the arthouse film crowd. Like several other powerful, female-centric 2018 dramas, its examination of women extricating themselves from situations where they previously sublimated their own ambitions and creativity for the sake of men and relationships is compelling and poignant. Give it a chance. Colette’s stories and biography have inspired generations of French artists, male and female. They may just inspire you, too. Starring Keira Knightley, Dominic West, and Denise Gough. Directed by Wash Westmoreland.